Today is the day for an over-the-top grilled cheese sandwich! It is National Grilled Cheese Day, after all. And I like to celebrate food days in grand style! Last year, I made my now famous Trainwreck Grilled Cheese! The husband loved it and the media ended up picking it up and it went crazy viral. ‘Til this day, Tim says it’s the best thing I’ve cooked for him. I politely choose to ignore it, as I’ve made things that are way more complicated than a grilled cheese. But the truth is that that grilled cheese is really to die for! This year, I’m celebrating with a Kale and Sausage Grilled Cheese Sandwich that will knock your socks off. I also added caramelized onions to the party, because why not? Caramelized onions make everything better! If you’re not a kale lover and are already making an exit, let me say you probably haven’t tried kale in the right recipe. I dare you try this sandwich and say: “Eeeew, kale!”. No, I triple dare you! And then, after you eat this and fall utterly in love with kale, I recommend you try my kale pizza and my collard greens and sausage risotto. Yep, collard greens and kale are related, so you can go ahead and make the risotto with kale instead, if that suits you! But enough of all those recipes that are not a grilled cheese sandwich. The birthday boy deserves all the attention! I don’t know about you, but when anything ooey-gooey enters the room, it immediately has my full attention. And in this case, with all the slightly bitter kale goodness, the delicious Italian sausage and the sweet and tangy caramelized onions, it has also all my heart! I know I’m probably biased, since I’ve been completely obsessed with the kale-sausage combination, but I am pretty proud of this creation! And I’m gonna go ahead and dare to say that this sandwich is healthy too. ? Okay, maybe I should phrase it as “nutritious”. My point is: kale is good for you and you get to eat it in a very decadent way! Isn’t that the best? Eating something healthy without feeling like you’re chewing grass? I know, I know. How dare I say that this incredibly carby grilled cheese sandwich, full of melted cheese, butter and sausage is good for you. It’s like saying chocolate is a vegetable because it comes from a tree! ? 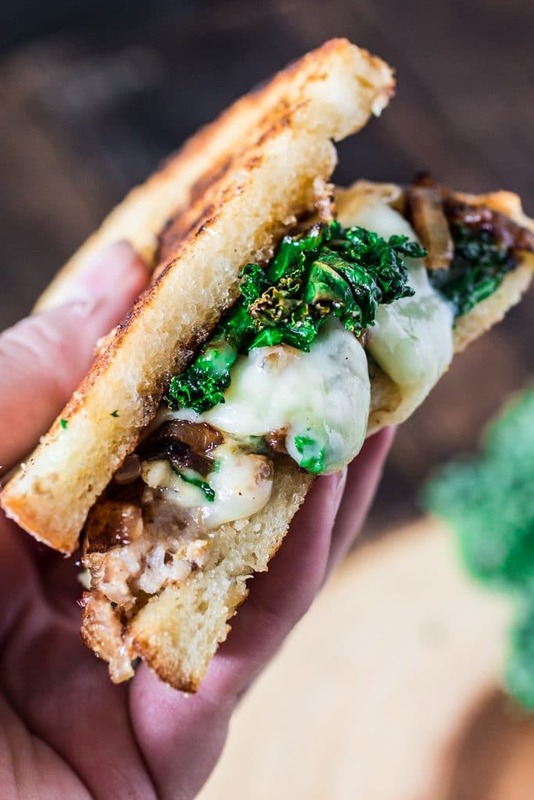 But you guys get the picture: kale = good for you, so grilled cheese = good for you! Or at least “not bad for you”. And I rest my case! ? 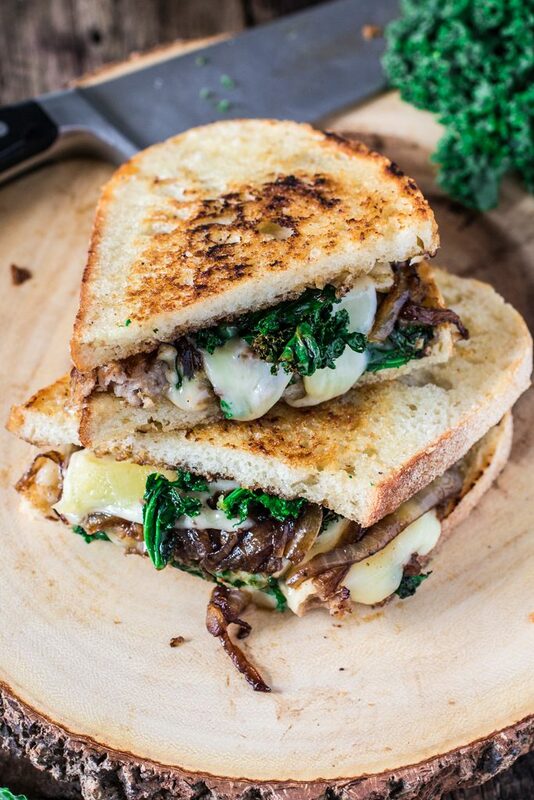 For my Kale and Sausage Grilled Cheese Sandwich, I chose to use Fontina cheese because it melts beautifully and it has a mild, nutty flavor that I think goes really well with the other flavors in here. However, feel free to use your favorite kind of cheese, or whatever you have on hand. Gruyére, mozzarella, white cheddar and gouda would also be amazing in this sandwich! And because I always have a lot of sweet Italian sausage in my fridge, that’s what I used. But if you’d like a spicy kick, go ahead and use Hot Italian Sausage. A little heat is always a good call! I can see this kale and sausage grilled cheese making lots of appearances in my household in the near future. I hope it does in yours too. And if it happens, make sure to take a picture and post on Instagram (tagging @oliviascuisine) so we can be grilled cheese BFFs! ? Happy National Grilled Cheese Day! Heat a large sauté pan, or skillet, over medium low heat. Add 1 tablespoon of butter and, once it melts, add the sliced onions and stir them gently to coat with butter. Cook for about 10 minutes, stirring often, or until they are soft and start to get golden brown. Add the balsamic vinegar and scrape any browned bits from the bottom of the pan. Continue cooking for an extra 5 to 10 minutes, or until they are caramelized and golden brown! Season with salt and pepper and reserve. In that same pan, over medium heat, heat the olive oil and cook the sausage, breaking it apart with a wooden spoon, until it is no longer pink. Then, add the kale leaves and continue cooking until the sausage is cooked through and the kale has softened. Season with salt and pepper and reserve. To assemble the grilled cheese sandwiches, spread the remaining butter evenly on all bread sides. Layer each bottom with cheese, sausage and kale mixture, caramelized onions and finish with some more cheese. Top each sandwich with its top bread slice and place them in a sauté pan, over medium heat. Grill for 2 to 3 minutes or until the bread is golden brown. Flip and cook on the other side for 2 more minutes or until golden brown and the cheese has melted. Crispy, crunchy, obey gooey goodness right there! What a fantastic combination of flavors. I didn’t have a grilled cheese offering this year and will kindly bask in the light of this one. I’d go the spicy route and choose the Hot Italian Sausage for sure. YUM. Delicious! can’t beat a good grilled cheese! You just can’t go wrong with a delicious grilled cheese! Sausage and kale sounds like an excellent combo and I LOVE fontina! My husband would LOVE this sandwich!